As part of my blog detox, I am no longer doing blog posts in return for gifted items, which is how I always worked with M&S in the past. 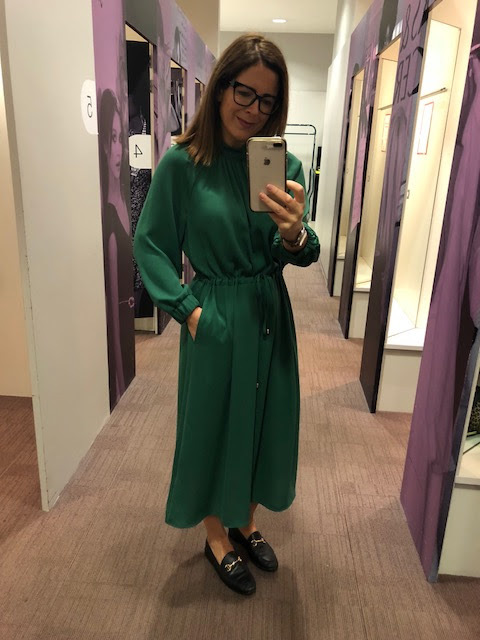 They've been hugely supportive of this though and we have agreed that instead of monthly gifted product posts, I'm going to do occasional try-on posts where I'm paid for the time spent in store and writing this. I think it's better content too - you'll get to see more of what's in store rather than just a few items I'm sent. 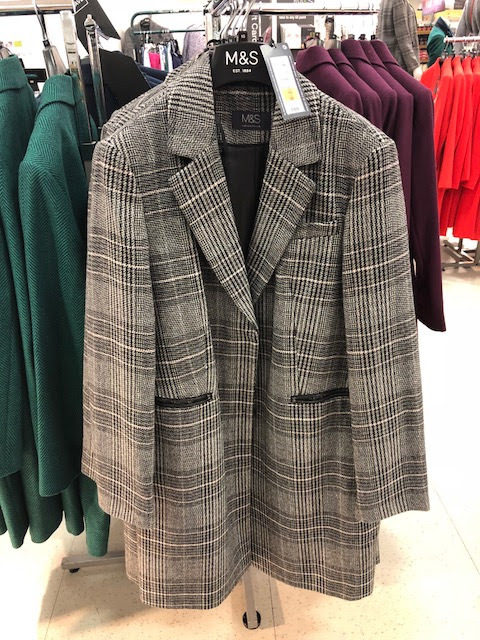 I'm not tied to any particular department in M&S or to feature any brand - my only brief was to share some of the new range that's come in for Autumn Winter so I headed to Forestside and here's what I spotted, starting with my weakness...coats! and here it is on me in a size 10. Fantastic value and such a classic shape - you'll wear it year after. I predict a sell out. 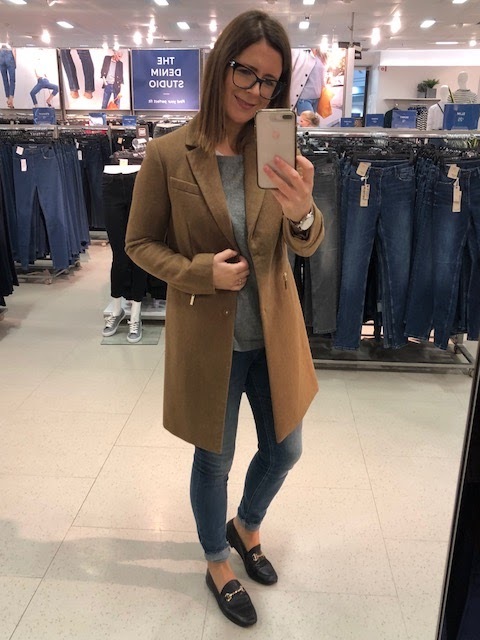 It also comes in a great shade of camel...this time I'm wearing the size 8 and it works find on me with a light knit so they're a little on the large side. 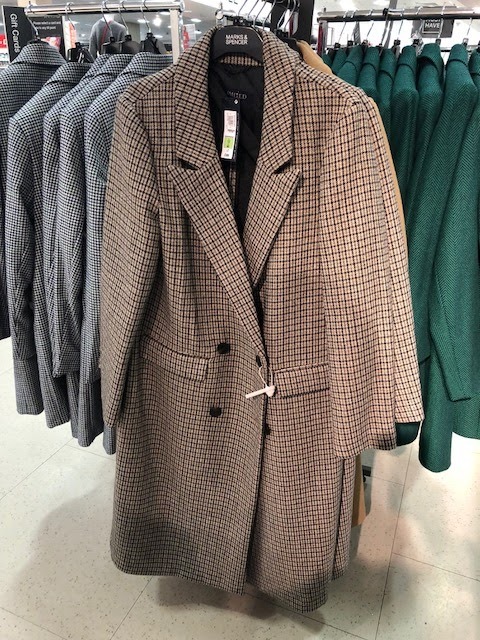 And here's where I lose patience with the M&S website because these coats are SO difficult to find online. I could only find the grey check one by going into the green one and selecting other colourways. And there's no sign of the camel one at all. Loads of them on the rails in Forestisde though! 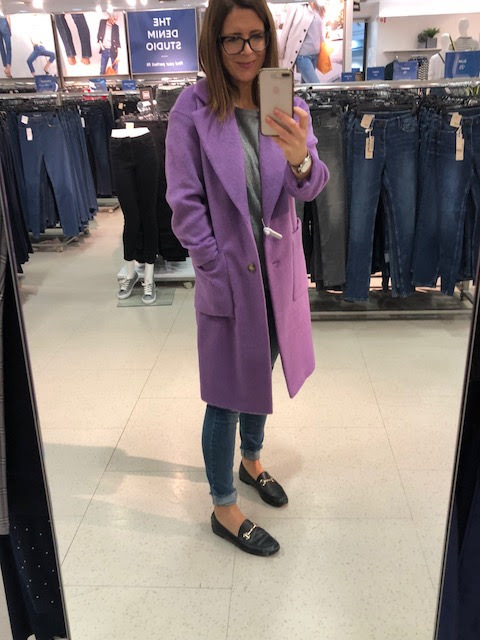 BUT ditto on the website woes - loads in store but can't find it in either this colour or the navy it also comes in online. From memory, I think it was £99 but don't quote me on that. 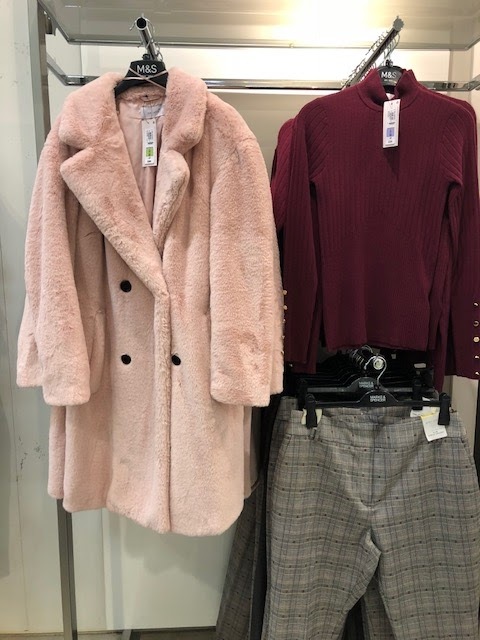 Fur coat, Burgundy Knit & Checked Trousers - all Per Una! 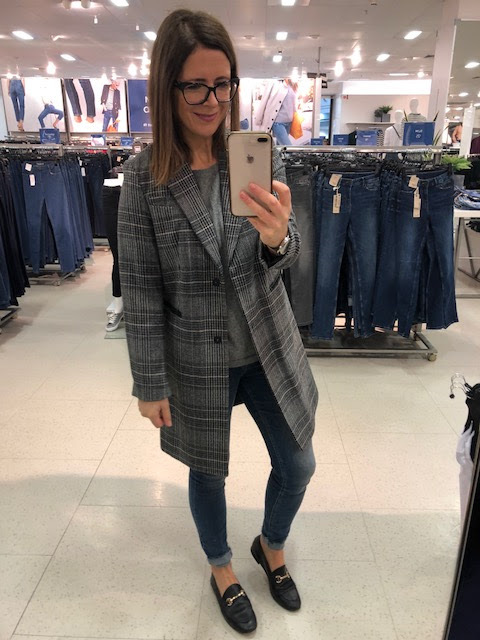 Into the changing room now and this jacket was my favourite thing I brought in to try. It's really me - monochrome, angular, smart/casual and I love the subtle sports luxe vibe going on with it. 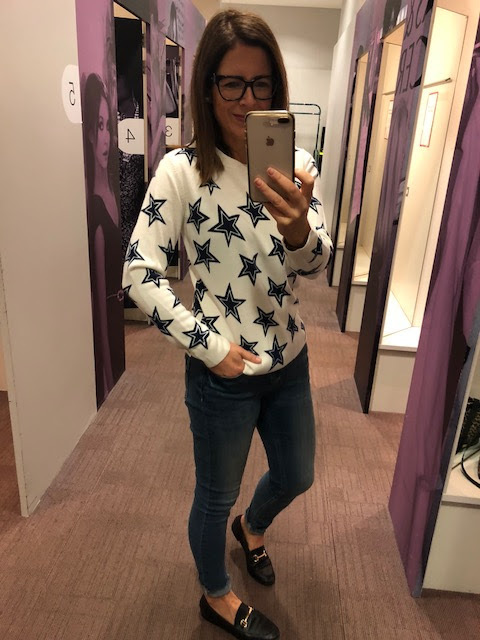 My daughter chose this next jumper for me to try on. It ticks lots of boxes but it has become a bit of an Instagram hit (which as you know, makes me want to run a mile!) but at the end of the day, the reality is it's the wrong shape for me. And the sleeves are WAAY too long. I'm wearing the S here. 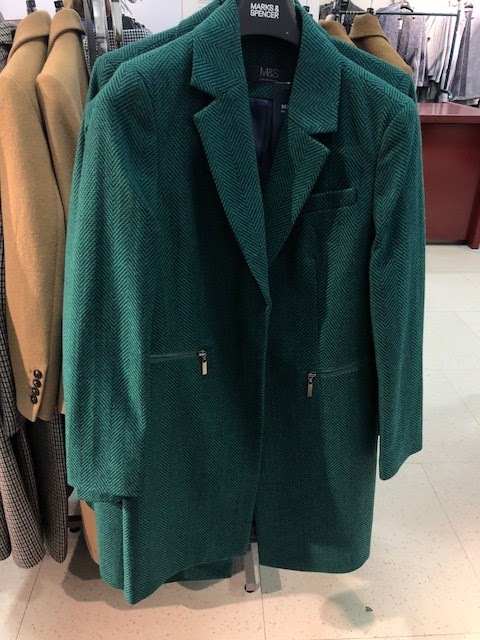 Instead this next one is a proper M&S gold - all the hush and Mint Velvet vibes for less than £20. It's so nice to wear and fits well. Would love it in another colour way too - black & red perhaps? This next dress had potential and looks good from the front but it's evil from the back. Be warned - industrial foundation garments required. Not for me but it's good to share the disasters as well as the successes isn't it?! A bit of a curveball next - this is from the current sale rail. 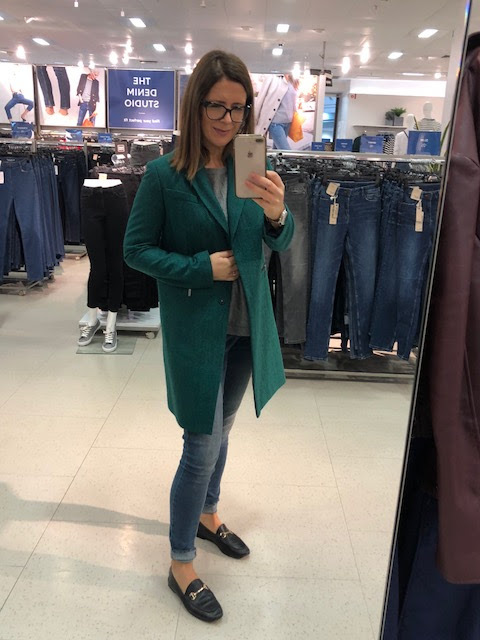 I've seen lots of bloggers try this one on and all I'll say is that it's worth buying in the sale but I'd never have paid full price for it. It's got the ultimate design flaw - those STUPID tiny buttons at the neckline with teeny tiny elastic loops that no person can ever close. My daughter was with me and even her tiny fingers couldn't close them. So if I had bought it, I'd have changed them but I didn't buy it in the end. 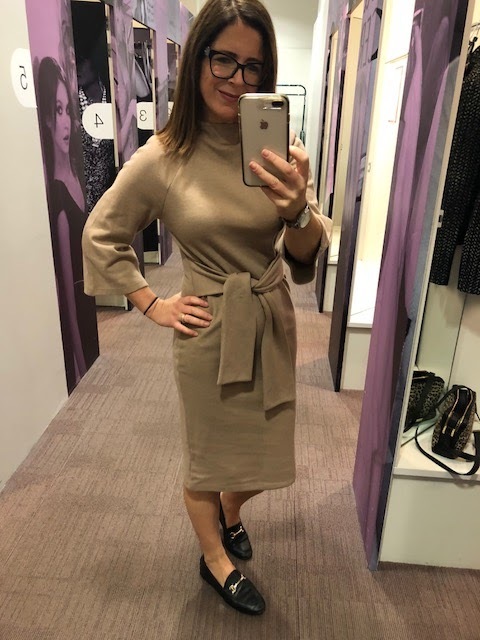 It could be styled up so nicely for winter but I think part of me is tiring of midi dresses a little...can't believe I am saying that on here! 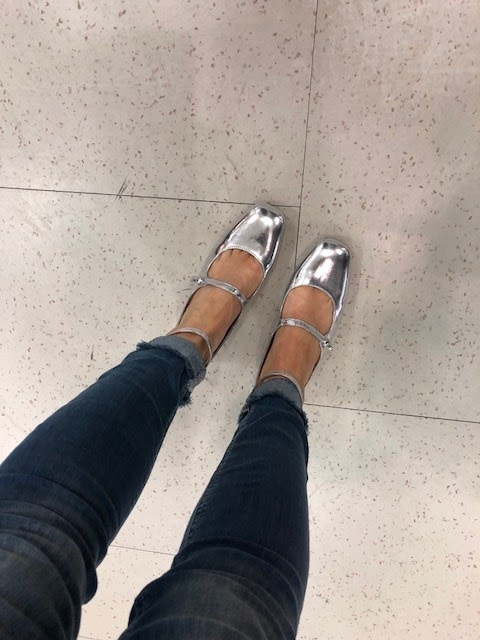 Back out on the shop floor and I wanted to check out the footwear before I left, starting with these silver strappy shoes which were a surprise hit. 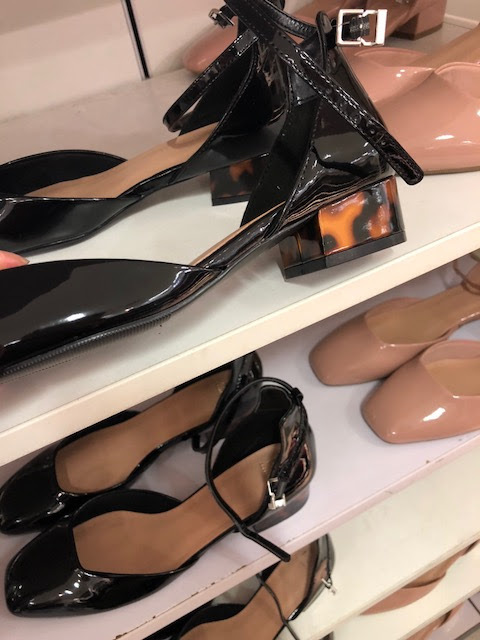 There was also these lovely black patent ones with a fab leopard heel! 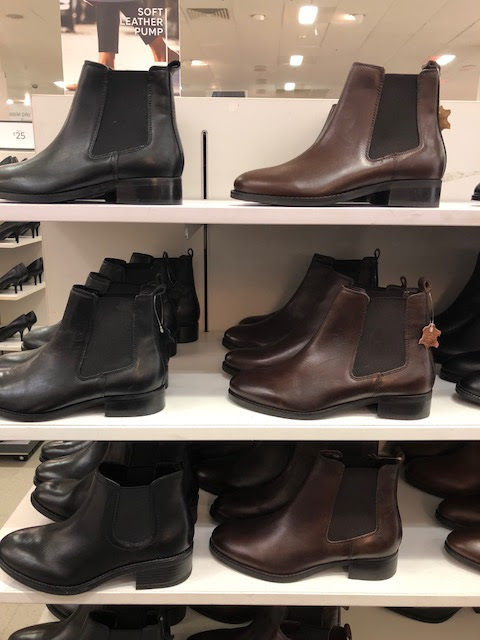 A dipped shoe boot is so flattering on the leg and can be worn with a skirt or with trousers. 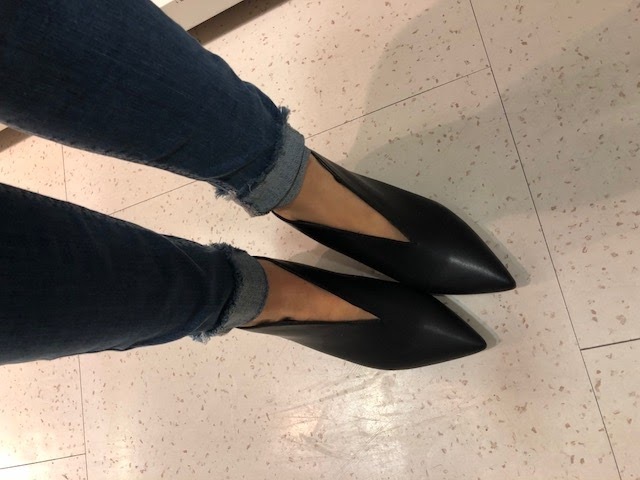 These are a great option and come in a leopard print too. They look absolutely RARE online - much better in real life! 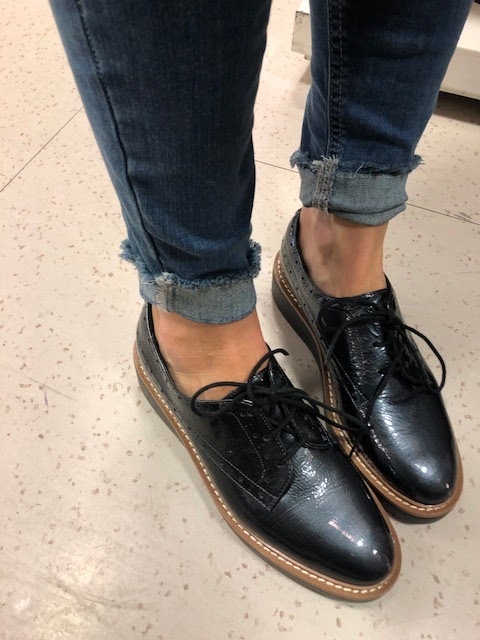 and now to the second piece I struggled not to buy - these platform brogues. The 2018 version of the ones that sold out in black & burgundy last winter. They're the most gorgeous metallic blue/black colour and so comfortable...almost sold out online! 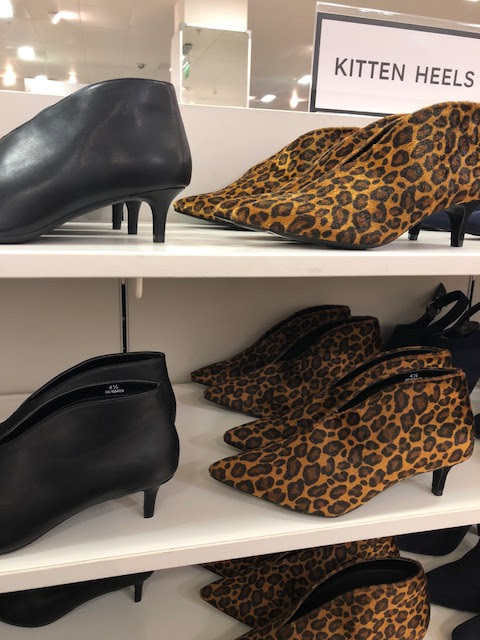 All told - M&S delivering well on the shoe front - these classic ankle boots are fab too and there are plenty of great colours for the season ahead including red again. 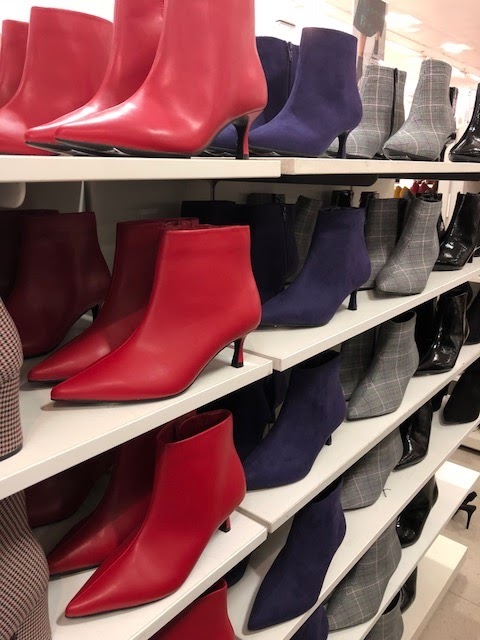 Yay to all of us who bought our red ankle boots last winter! 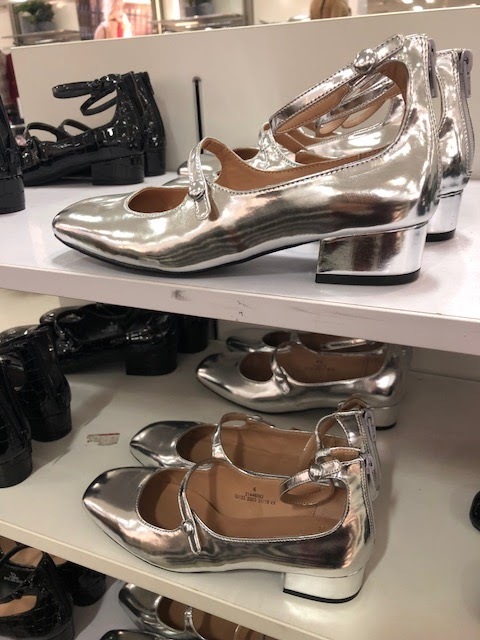 Hope you enjoyed this little peep into M&S...do ask if you've any questions about sizing. 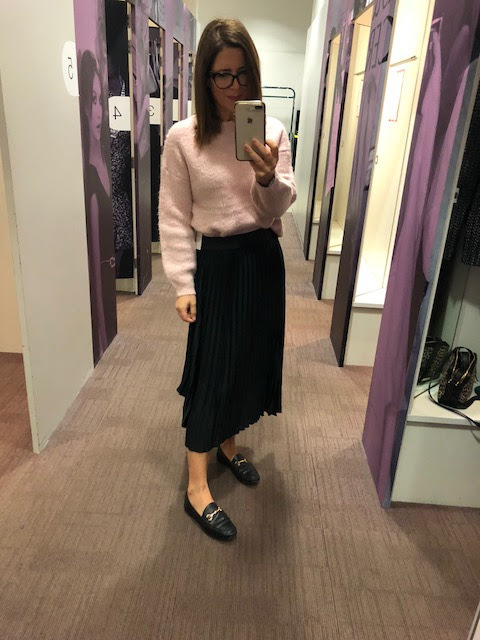 This blog post was written in collaboration with M&S but all the items I picked were my choice and the words are my own. The links are affiliate which means M&S know you came to their website from mine and may pay me a tiny commission if you buy and keep an item. This doesn't change the price of the item for you and the modest income I make from these links helps to keep this blog going. Thank YOU!